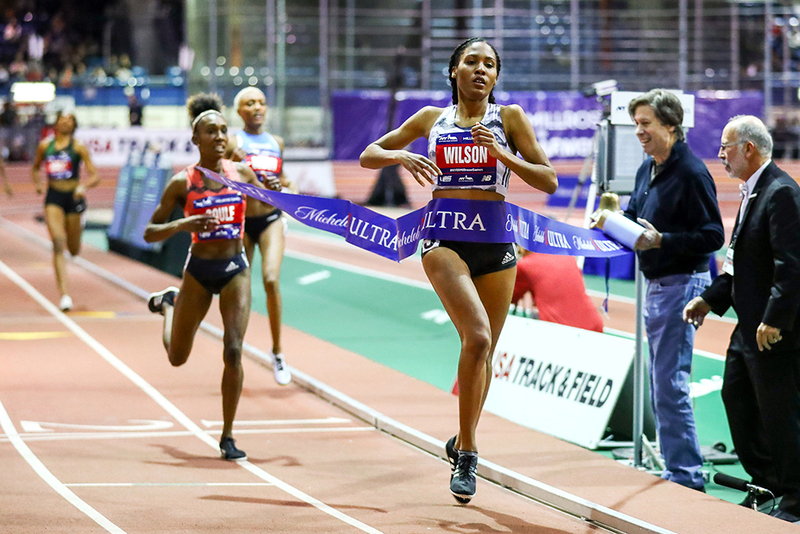 New York City, February 09—New Jersey native Ajee’ Wilson feels right at home at the Armory, where she has raced countless times since her prep days. She set an American Record in the 800 for the top women’s performance at the 112th Millrose Games. Goule clocked a Jamaican Record 1:59.13 in 2nd, while Ce’Aira Brown (1:59.74) broke 2:00 indoors for the first time and moved to No. 10 on the U.S. list. In the 60, comebacking English Gardner shocked the field, the crowd and especially herself to win in a PR 7.10 in her first race of the season. 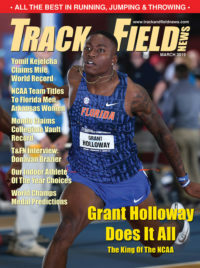 She surged past Trinidad’s Michelle-Lee Ahye (7.15) in the final 15m to chip 0.02 off her previous best, set while winning the NCAA title back in ’12. Germany’s Konstanze Klosterhalfen, now training in Oregon, broke away from the mile field just before 700m and won in a world-leading 4:19.98. Training partners Colleen Quigley and Kate Grace dueled for the runner-up spot, with Quigley pulling away on the final lap for a PR 4:22.86, moving to No. 4 on the all-time U.S. list. 60: 1. English Gardner (US) 7.10 PR; 2. Michelle-Lee Ahye (Tri) 7.15; 3. Javianne Oliver (US) 7.19; 4. Deajah Stevens (US) 7.20; 5. Marybeth Sant (US) 7.23; 6. Shania Collins (US) 7.25 PR; 7. Thelma Davies (US) 7.45. 400: 1. Jaide Stepter (US) 53.25; 2. Phil Healy (Ire) 53.72; 3. Brittany Brown (US) 53.76 PR; 4. Gabby Thomas (US) 54.50; 5. Maya Stephens (Can) 54.52. HS 600: 1. Athing Mu (US) 1:27.36 PR. 4. Raevyn Rogers (US) 2:01.33; 5. Olivia Baker (US) 2:03.57; 6. Chrishuna Williams (US) 2:03.68;… rabbit—Kendra Chambers (US) (26.85, 29.34 [56.19]). 9. Amanda Eccleston (US) 4:29.54 (4:10.98); 10. Emily Lipari (US) 4:33.97 (4:14.09); 11. Kaela Edwards (US) 4:40.74 (4:18.73); 12. Karisa Nelson (US) 4:44.23 (4:24.41);… rabbit—Stephanie Herrick (US) (65.07 for 409m). 7. Elinor Purrier (US) 8:57.30; 8. Lauren Paquette (US) 8:57.51; 9. Mel Lawrence (US) 8:57.58; 10. Sara Sutherland (US) 9:07.00. 60H: 1. Sharika Nelvis (US) 8.01; 2. Tobi Amusan (Ngr) 8.03; 3. Isabelle Pedersen (Nor) 8.24; 4. Astrid Nyame (Can) 8.34; 5. Phylicia George (Can) 8.37; 6. Lauren Micham (US) 8.60. 2. Rachel Seaman (Can) 6:28.39; 3. Katie Burnett (US) 6:50.08 PR. HS 4 x 200: 1. Bullis, Potomac, Maryland, 1:37.78 (AL). 2. Priscilla Frederick (Ant) 6-2 (1.88); 3. Levern Spencer (StL) 6-2; 4. Inika McPherson (US) 6-¾ (1.85); 5. tie, Jelena Rowe (US) & Amina Smith (US) 5-10¾ (1.80).